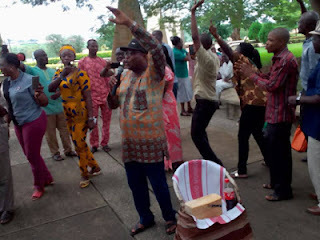 Senior staff of the Federal University of Agriculture, Abeokuta, on Friday presented a loaf of bread and a bottle of coca cola drink as a birthday gift to the school’s embattled Vice Chancellor, introducing a dramatic twist to their prolonged demand for his dismissal. The VC, Olusola Oyewole, clocked 61 on Friday. He has been having a running battle with the workers over allegations of financial misdeeds against ‎him and the pro-Chancellor of the university, Adeseye Ogunlewe. The Economic and Financial Crimes Commission, EFCC, which is investigated the matter, has interrogated the two officials. But the university staff, under the banner of Senior Staff Association of Nigeria Universities, have continued with their protest, demanding the removal of the VC. The lecturers added a drama to their protest on Friday, with their birthday presentation to the VC. 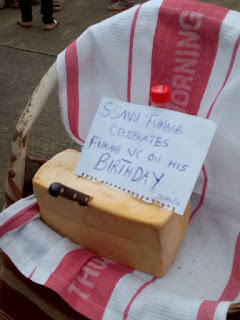 Executive members of the association delivered the surprising birthday gift to the VC’s office Friday afternoon. They were however intercepted by the institution’s Chief Security Officer, Peter Bolarinwa, who promised to deliver the bizarre package. They also demanded the reinstatement of three of their colleagues, Abdulsobur Salam, Lasun Somoye, and Abimbola Bankole, who were suspended for sending a petition to the EFCC, leading to the investigation. Bjay Ademola is a blogger. He has passion for disseminating information to the public. Petalsblog is dedicated to providing outstanding and unique articles that will enlighten the general public. .
Disclaimer: Opinions expressed in comments are those of the comment writers only and does not exhibit the views of Bjay Ademola.